Guess what? This conspiracy theory post is not about Trump, and like the C post on the Church Committee, it is really real. Let's go back to 1933. 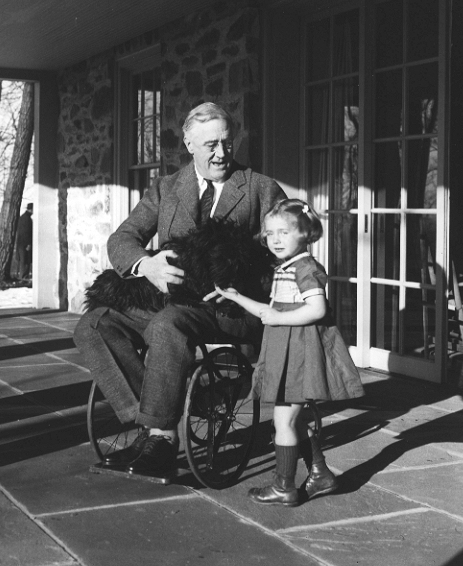 Democrat Franklin D. Roosevelt defeated republican Herbert Hoover to become the 32nd President of the US during the Great Depression. Luckily, this plan never got past the planning stages. The group chose Marine Corps Major General Smedly Butler to lead the coup. Problem? This guy supported FDR in the election. D'oh! Smedly ratted them out to a congressional committee, the conspirators said, "Oh no we didn't! ", and no one was brought up on criminal charges. The end. Or was it? 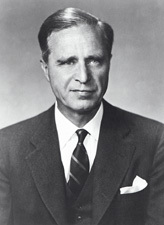 That connecticut senator, a fellow named Prescott Bush, would see both his son, George Herbert Walker Bush, AND grandson, George W. Bush, became presidents of the US. According to Wikipedia, fascism rejects assertions that violence is automatically negative in nature, and views political violence, war, and imperialism as means that can achieve national rejuvenation. Are you surprised that Prescott Bush would be associated with a fascist coup? 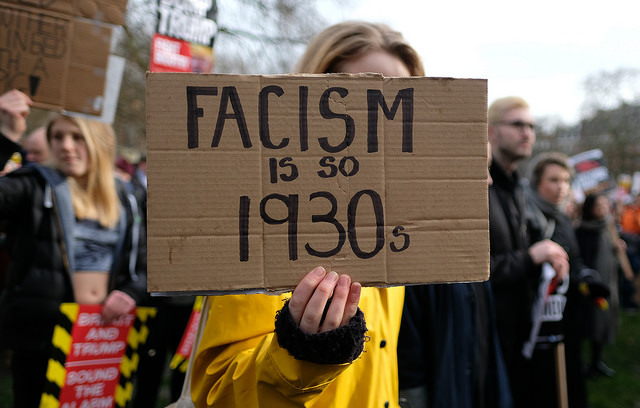 Did either (or both) of the Bush presidencies contain elements of fascism in your opinion? We swing on a pendulum in the states. We'll all be libs in ten years. Then twenty years in, we will start swinging back. I think we are too cantankerous to be that controlled. I hope. The biggest danger is incompetence which is Trump's real problem. What scares me the most are people who think "God" is on their side. That is fanaticism and unhealthy. But things are what they are with humanity. I grew up in the South and know the "Big House" mentality. 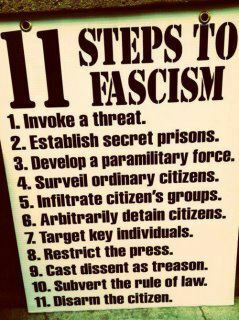 If people can't remember or don't recognize it and keep voting these rascals in, the "Big House" will control unabated. I read a quote, I think by Voltaire, that said something like, the person you should fear is the person you're not allowed to criticize. As long as we're allowed to throw verbal rocks at our leaders, I feel safe. Whenever we're told dissension and freedom are the problems- I get scared. Um, sorry, but that quote was not Voltaire, it was a neo-Nazi Holocaust denying racist called Kevin Strom, in a very different context. One of our politicians misquoted it and was laughed at. Nice point made by Elizabeth Seckman. I was surprised to learn we had a facist plot in the 30s. But in a way, I think that may have lingered in the anti communist scare that gave us McCarthyism. I hadn't thought about the Gulf War being facist, but during the invasion of Iraq, it came out that Rumsfeld and Cheney and several neo conservatives had a plan for "Pax Americana", The Project for the New American Century. That was pretty spooky. I don't know anything about Grandpa Bush - interesting. 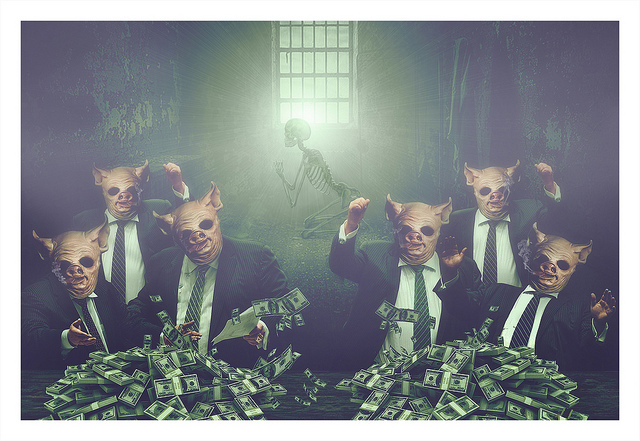 Greed is a strong motivator. When Trump was elected, immediately there was this meme about George W Bush popping up, a smirk on his face and a speech bubble saying "and you thought I was an a******!" local councillors, MPs and even our local village hall committee. The theory being that even if they stand with the best of intentions once in power they somehow go wrong and get all power mad. Many thanks yet again for your visit. I was so glad to hear this wasn't anti-Trump. I get so tired of them! I had heard that about the Bush family (I think in Meachan's biography of G H W Bush. The 30s were troubling times. I'm not sure what would have happened had Huey Long had lived (he was murdered) and he and Upton Sinclair had run (as they'd planned) against Roosevelt in 1936. That could have been a scary ticket, too. Grandpa Bush must have felt great - nice to see the descendants carry on the work. I don't know if I can keep checking here! Depressing on top of depressing. I knew there was something to worry about the current state of the US presidency when even Bush had his concerns. it's interesting that my autistic brother in law, who is the topic of my blog, had a very simple explanation for why he voted the way he did: (the candidate he voted against) "was mean". Too bad we don't live in a black and white world, but that little tidbit about Prescott Bush is scary indeed. Thanks, Tamara! Who would have known that one of the conspiracy theories we which we hear about was actually true? There is a born-to-rule mentality among some folk born with a silver spoon in the mouth. We have some here in Australia too, though I think none of them is competent enough to get such a coup off the ground. Interesting! I didn't know about this one. Curious how history always seems to repeat itself, isn't it? I didn't know this either. Nicely put. My #AtoZchallenge is anything Writer(ly) writing, advice, tips, tricks etc. Check it out! Not at all surprised. Poppy Bush was a war profiteer, so it stands to reason that his son and grandson would be a-okay with that kind of thing. I'm not surprised at the Fascist plot in the '30s. There was something in the air, which is why it did take hold other places. We were lucky. Then.